Welfare economics is a branch of economics that focuses on the optimal allocation of resources and goods and how this affects social welfare. Welfare economics analyzes the total good or welfare that is achieved at a current state as well as how it is distributed. This relates to the study of income distribution and how it affects the common good. Welfare economics uses microeconomic techniques to evaluate well being of people within an economy. It evaluates well being from allocation of productive factors as to desirability and economic efficiency within an economy. It analyzes social welfare in terms of economic activities of the individuals that compose the theoretical society, which is considered. Hence, individuals with associated economic activities are the basic units for aggregating to social welfare. Whether of a group, a community or a society, there is no “social welfare” apart from “welfare” associated with its individual units. Welfare economics uses the perspective and techniques of microeconomics, but they can be aggregated to make macroeconomic conclusions. Because different "optimal" states may exist in an economy in terms of the allocation of resources, welfare economics seeks the state that will create the highest overall level of social welfare. Some people object to the idea of wealth redistribution because it flies in the face of pure capitalist ideals, but economists suggest that greater states of overall social good might be achieved by redistributing incomes in the economy. Welfare economics takes individual preferences as given and find a welfare improvement in Pareto efficiency terms from social state A to social state B if at least one person prefers B and no one else opposes it. There is no requirement of a unique quantitative measure of the welfare improvement implied by this. Another aspect of welfare treats income/goods distribution, including equality, as a further dimension of welfare. 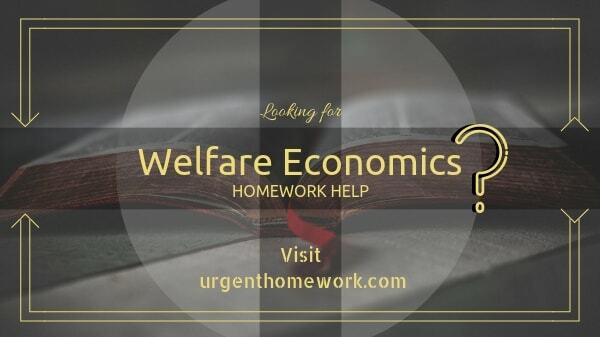 Contact urgenthomework.com for welfare economics homework help and welfare economics assignment help.